Notification for Vijaya Bank Clerk Recruitment 2012 has come out just today through its advertisement "RECRUITMENT NOTIFICATION: 02/2012" for 800 Probationary Clerks. This becomes the 16th Clerk Recruitment Notification on the basis of IBPS CWE 2011. As per the notification, submission of online application form for Vijaya Bank Clerical Recruitment 2012 has started from today (i.e. 16th August, 2012) and the last date of online registration/submission of form is 5th September, 2012. You can also click here to download Vijaya Bank Clerk Recruitment 2012 notification/advertisement. Total number of bank clerk vacancies through IBPS CWE 2011 has now crossed twenty thousand (to be precise: 20,720). Prior to this notification, fifteen PSU banks had issued recruitment advertisement for 19,920 clerical positions, as can be seen in the table at right. Only following three banks (out of the nineteen PSU banks which had participated in IBPS CWE 2011 Clerk) are yet to issue recruitment notification/advertisements: Punjab National Bank, Central Bank of India & Oriental Bank of Commerce. You can find details of the clerk recruitment in PSU banks in 2012 in my previous blog article titled: IBPS CWE Clerk Cut-Off Mark Bankwise State-wise, Category-wise. Similarly, out of the nineteen PSU banks which had participated in IBPS CWE PO, only two bank (i.e. Andhra Bank & Oriental Bank of Commerce) remains to issue recruitment advertisements. Seventeen PSU banks have issued already recruitment notification for a huge 19,248 bank PO jobs. You can find a detailed article on bank PO recruitment in my previous blog article titled: IBPS CWE Score Cut-off for PO Bank-wise: for all banks. 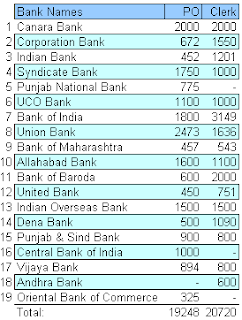 The table above gives you the bank-wise number of clerk & PO recruitment through IBPS CWE 2011 so far. This blog post summarizes the Vijaya Bank Clerk Recruitment Notification 2012 by quoting the eligibility as well as telling you how to apply online. It also tells you how to prepare for Vijaya Bank Clerk Interview towards the end of this article. 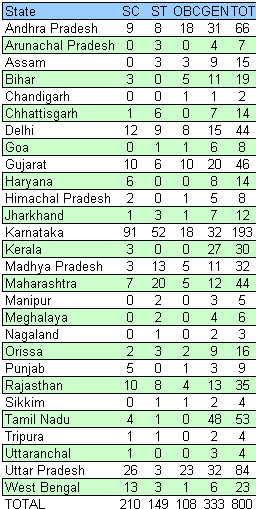 You can find the state-wise category-wise vacancies in the table at right. This State-wise vacancy is very important as you have to apply for the clerk positions state-wise and you should be able to read, write, speak local language of that state. Moreover you should have appeared IBPS CWE 2011 from a centre of that state for which vacancies you want to apply. Age Eligibility (as on 01.08.2011): Min 18 yrs, Max 28 yrs. (Relaxations exists as per Govt rule). Degree in any discipline from a recognized Board/University. Candidates with higher qualification will have added advantage. Preference will be given to computer literate (proficient in MS-Office BasicApplications). 1.0 You should have appeared & qualified IBPS CWE 2011 from a centre in that State/UT for which you wish to apply. 2.0 You should be able to read, write and speak official language of that state. 3.0 Should be able to read, write and speak English fluently. In addition, you should possess the State-wise/category wise minimum Cut-Off Marks Total Weighted Standard Score (TWSS) as given in section; "5.3.a. IBPS CWE-CLERK2011 Score" in page-1/2 of the notification. Based on the CWE scores of the applicants received by Vijaya Bank, it is going to shortlist the candidates for personal interview. Interview shall contain 100 marks and the minimum qualifying mark in Interview is 40% (35% in case of Reserved Categories). TWS: 250 marks & Interview: 100 marks. You would be sent your call letter for Vijaya Bank Clerk Interview in the e-mail specified during form submission. You should also check this Vijaya Bank career/recruitment webpage for updates. You can apply for Vijaya Bank Clerk Recruitment 2012 only online, There is no offline form. Click here for Vijaya Bank Clerk Recruitment 2012 Online Form. The online form would be available from 16th August to 5th September , 2012. You would also need this fee Payment Receipt Challan. 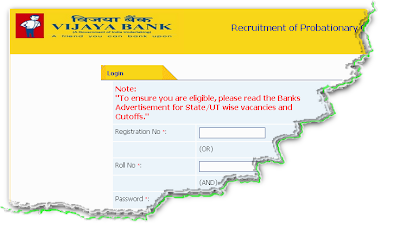 Click here to find how to fill the Online Form for Vijaya Bank Clerk Recruitment 2012. This blog has excellent materials to help you prepare for the Vijaya Bank Clerk Interview with a list of Interview questions. For Interview, click here to visit this article, which tells you what are the requirements an interviewer looks for in you. It also gives you an interesting You Tube video telling you how you can also analyze an interviewer and hence be prepared for it. And than it gives you a list of 99 interview questions, which are most repeated in every other interview! These questions helps you prepare yourself. In addition since how much you know about Vijaya Bank would almost inevitably be asked, you should go through this About us page of Vijaya Bank & Wiki. Following are the traits which generally checked in Bank Clerk Interview: Attitude, Personality, level of communication, clarity and problem solving innovativeness, knowledge /proficiency in local/State language (ability to read, write and speak local/State language) level of effectiveness in computer operations, willingness to work anywhere in the State. Hope with above information on Vijaya Bank Clerk recruitment you can not only apply with ease but also get that coveted Vijaya Bank job easily. You should also visit this Vijaya Bank Career/Recruitment webpage for subsequent updates like for downloading call letter/admit card, result etc. I would post dedicated blog article as and when the remaining three banks (i.e. Punjab National Bank, Central Bank of India, & Oriental Bank of Commerce) issues recruitment notification for clerks. So please keep visiting this blog!